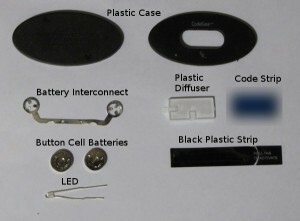 Here we see the internal bits, labelled in the picture to the left. I have blurred the code strip to prevent the contest holder from getting on my case. The plastic strip blocks the batteries from contacting the LED and covers the code numbers, requiring you to remove the strip to both see the numbers and activate the electronics. The LED is sandwiched between the code strip and the backing of the plastic diffuser to back light the code. 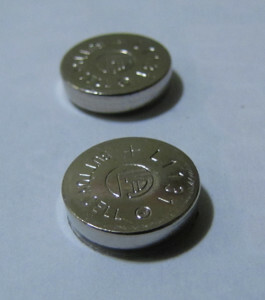 The battery interconnect is simply a piece of stamped metal to complete the circuit. The more interesting parts are the batteries and the LED (which are the only parts worth anything, in my humble opinion. The LED inclued with this particular one was a super bright, blue one. That’s it! Not much to them, but you get a few fun electronic bits for free. This entry was posted on Tuesday, April 17th, 2012 at 9:14 pm and is filed under Hardware. You can follow any responses to this entry through the RSS 2.0 feed. You can leave a response, or trackback from your own site.